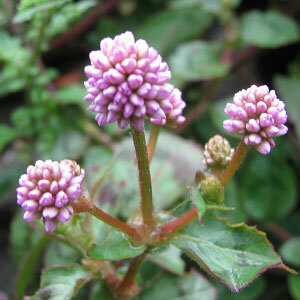 Oxyria digyna is a perennial herb with 15-80 cm height. Leaves are basal, kidney shaped with broad heart shaped base and oblique apex. Flowers are green tinged with pink, small and in terminals panicles. Fruit is broadly winged. Way sides and cultivated lands. Whole plant is used as an appetizer and laxative. The leaves are rich in Vitamin C. In Nepal cooked leaves stems and roots are eaten in case of dysentery. 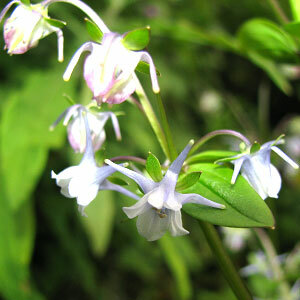 It is found in the middle and deeper parts of the valley. 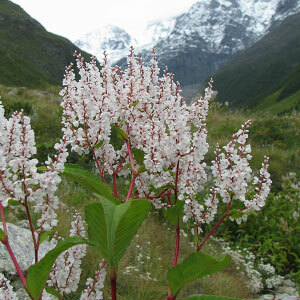 It is also found on the bank of Hemkund Sahib Lake. It is mainly found near water sources. Following are some of the pictures of the Oxyria digyna,hope you will like them all. If yes do not forget to comment or share with your friends. Halenia elliptica is an annual herb of 10 - 90 cm tall with sub-quadrangular stems. Leaves are opposite, sessile and elliptic ovate. Flowers are pale blue, in axillary or in terminal, branched clusters. Spurs are attractive projecting back and outwards. Stamens are 4. The specific name Elliptica refers to elliptic shape of the leaves.